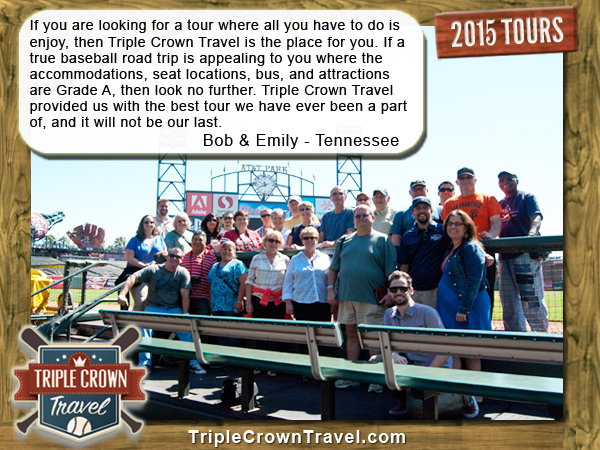 Triple Crown Travel Baseball Tours is the Premier Provider of Baseball Vacation Road Trips in the United States. Triple Crown Travel is hosting 7 different tour options for the 2019 Baseball Season! Choose from several East Coast Hall of Fame Tours, a Texas Midwest Tour, a Chicago Heartland Tour, a Toronto Great Lakes Tours, our ever popular California & Hearst Castle Tour or an Arizona Spring Training & Opening Day Baseball Tour. Whichever ballparks are still on your bucket list, we are sure to have it covered. Our baseball tours are carefully crafted to build an itinerary that lets you maximize the time you have in each city. No overnight or late night bus rides to your next destination, or staying in small motels far away from the ballparks you are visiting. Rather as a full-scale, accredited travel agency and tour operator, we provide a personal tour host, top of the line charter bus transportation, lower level seating for all games, and upscale hotels (Marriott, Hilton, Hyatt) every night, many times within walking distance of the ballpark you have just watched a game in. As a special offer for SpringTrainingOnline.com visitors, we are offering $50 off per person for any of our baseball tours by using the discount promo code “springtraining” at checkout. Simply click on the link below to view and register for one of our baseball tours today!